Nonwoven geotextile fabrics are often referred to as 'multipurpose', and to a great degree deliver on that promise. Contributing to their popularity is their cost-of-manufacture to weight ratio is less than their woven counterparts. The manufacturing process of nonwoven geotextiles is very different from that of woven geotextiles, with needlepunched finishing as the leader. When used in filtration applications it is important to note that the actual mechanics of this function by nonwoven geotextiles are much different than the original woven monofilaments. Nonwoven geotextiles consist of fibers that are either continuous filament yarns or short staple fibers which are then bonded together by various processes that can include a needling process that intertwines the fibers physically (needlepunched), or a chemical / thermal bonding operation that fuses adjacent fibers together. The resulting nonwoven geotextiles have a random fiber orientation with high porosity and permeability, indirect and unpredictable openings, a thickness ranging from thick felt to a relatively thin fabric, and low modulus with high elongation. A joint committee, formed from the American Association of State Highway and Transportation Officials (AASHTO) and the Industrial Fabrics Association (IFAI), developed a general platform to standardize geotextiles for general transportation applications. The current revision for this standard is AASHTO: M288-15. AASHTO: M288-15 is NOT a design guideline. The selection criteria are based on an engineer's knowledge of the site-specific installation stresses and soil hydraulic properties for the project application. 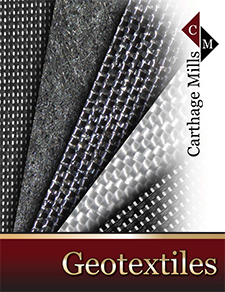 Click here for a Geotextile Selection Guide and the appropriate Carthage Mills product. For further information on Carthage Mills and AASHTO: M288-15 contact your local Carthage Mills Representative or call (800) 543-4430. To order a copy of the complete AASHTO: M288-15 Specification, contact AASHTO at (202) 624-5800.